Carlos Ghosn, the mastermind behind the Nissan-Renault-Mitsubishi alliance, was arrested on 19th of November. The sudden fall of such a monumental figure will undoubtedly produce reverberations across the chess board. The growing tensions within the alliance and the hazy circumstances of Mr. Ghosn’s arrest already rattled investors, and it is becoming increasingly difficult to predict the future of the triad. With the architect and leader of the union behind the bars, what will become of the Franco-Japanese partnership? On the 19th of November, Ghosn, a Brazilian-born French citizen, was accused of submitting misleading reports in which he intentionally understated the magnitude of his financial remuneration at Nissan. The Japanese prosecutors claimed that Nissan financial statements fail to acknowledge extra ¥5bn ($44m) that Mr. Ghosn had allegedly received between 2010 and 2017 and another ¥1bn ($8.8m) he was to receive in deferred compensation after his retirement. In addition, he is also claimed to deliberately falsify the financial documents to conceal the potential improper use of company funds to acquire real estate in Lebanon and Brazil. Exactly ten days after the arrest, the executives of Nissan, Renault and Mitsubishi published a joint statement in an attempt to calm the investors and persuade them in their willingness to continue their industrial partnership. The communique claimed that the three boards “… individually and collectively -- emphatically reiterated their strong commitment to the alliance. The alliance has achieved unparalleled success in the past two decades. We remain fully committed to the Alliance.” Still, even though instant disintegration of the alliance might not be a desirable outcome for all three companies, it is most likely that the alliance is poised to experience a series of great transformations. Although the Ghosn scandal brought the unease in the relationship between the three to the surface today, the growing discontent of Nissan with the current organization of the alliance has been accumulating for a prolonged period of time. 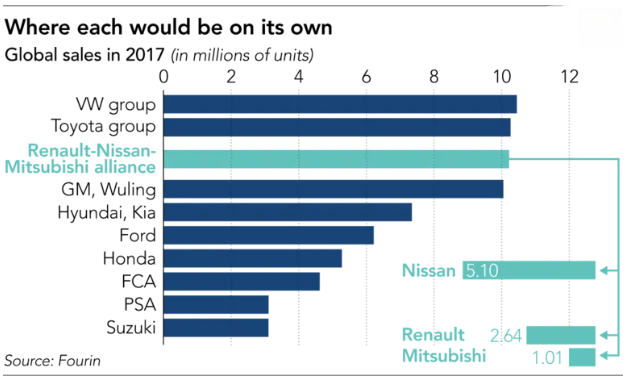 Since the start of the strategic partnership in 1999, Nissan has turned from a car manufacturer on the brink of collapse overwhelmed by cost inefficiencies to the healthy company with vehicle sales more than double of Renault. Currently, Renault enjoys an unmatched level of control and ability to appoint senior executives ensured by its ownership of 43 % of Nissan shares, whereas Nissan is left only with 15% of Renault non-voting shares. 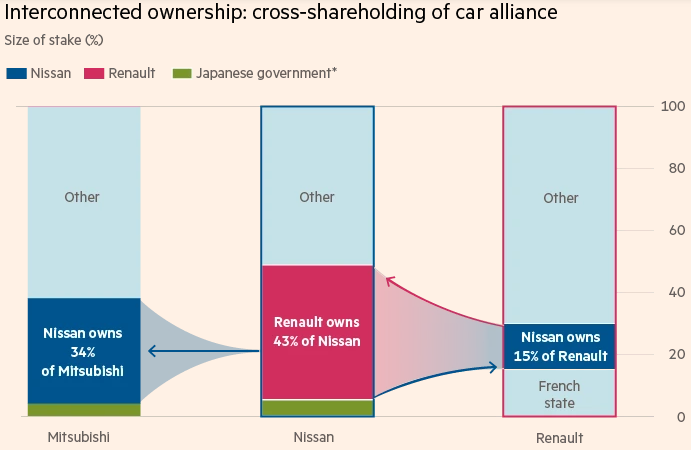 The highly unbalanced distribution of control and voting rights is the heritage of Nissan’s crisis and its subsequent rescue by Renault in 1999. Thus, the outbreak of Ghosn scandal (that emerged from Nissan internal investigation) might serve as an ideal moment for Nissan to advance for an influence within the alliance commensurate with its prevailing profit figures and corporate value. ​In contrast, Renault’s main objective would be to maintain its current dominant position and repel any encroachments on its control. Even more so, according to FT, not long before an inception of the Nissan internal probe, Ghosn and Renault proposed a review of capital ties within the alliance in order to intensify the convergence of the three automakers, which would ultimately lead to consolidation of Renault’s control over the Japanese counterparts. The French government is another major player that will endorse the continuation of current status-quo. Paris, which controls over 15% of Renault shares, risks the shift of production out of France and consequent reduction in the 48,000 workforce currently employed at Renault factories in case of a more equitable structure in the alliance. Bruno Le Maire, the French economy and finance minister, announced his intentions directly: “I do not want any change in the balance of power between Renault and Nissan or the levels of cross-shareholdings." Therefore, it is reasonable to expect that this conflict of interest would soon grow into a power struggle between Japanese and French sides. ​The Japanese have already made their first broadside as they had rejected resolutely Renault’s attempts to transfer Ghosn's chairmanship of the Renault-Nissan board to his French deputy Thierry Bollore. This resolute was followed by Nissan’s chief executive Hiroto Saikawa’s commentary: “The alliance in the future should not rely on "one particular individual, and aim for a more sustainable structure”. Similar remarks were voiced by Mitsubishi CEO Osamu Masuko: “There are no plans to name an interim alliance leader. Instead, leadership will be shared among the three companies' CEOs”.